A lot of movies that I love are widely regarded as bad; they are often labeled flops, failures, train wrecks, disasters… and once in a while, I feel like defending one of them. Today it’s one of Steven Spielberg’s two flops (the other is Always, which I have not seen), a big-budget comedy spectacular called 1941. So let’s get to it. 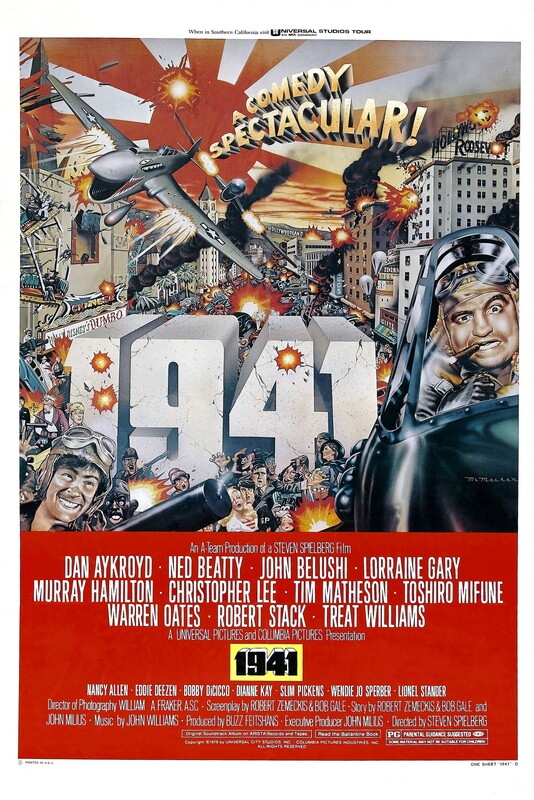 1941 is a World War II movie that starred a who’s who of late ’70s comedy: John Belushi, Dan Aykroyd, John Candy, Tim Matheson, Robert Stack, Ned Beatty, Eddie Deezen, Wendie Jo Sperber, and Slim Pickens, along with dramatic actors like Treat Williams, Warren Oates, Robert Stack, Toshiro Mifune and Christopher Lee. The movie is mean to be a farcical look at some of the fear and hysteria that hit the west coast following the attack on Pearl Harbor, some of it justified by actual events. In fact, a number of real incidents are woven into the plot; there were numerous reports of submarines being spotted off the coast, as well as unconfirmed reports of Japanese planes flying over coastal areas. Chuck Sitarski HATES eggs. 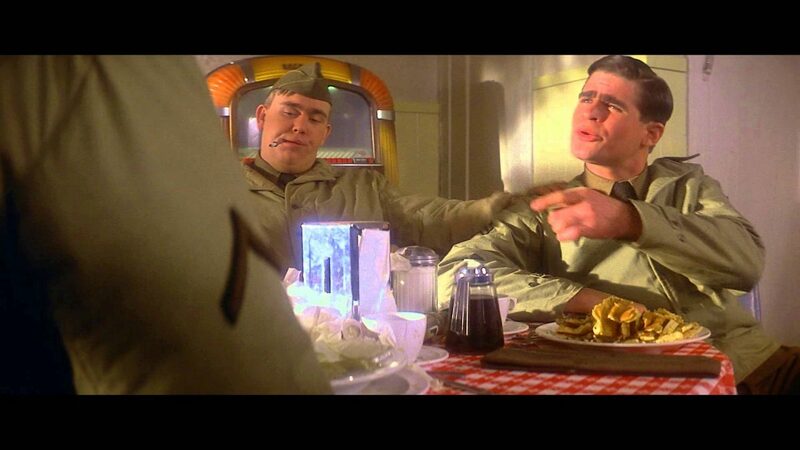 Treat Williams with John Candy in ‘1941’. Wally (Bobby Di Cicco), a dishwasher at a restaurant, accidentally provokes conflict with a group of army personnel (including Dan Aykroyd, John Candy, Frank McRae, and Mickey Rourke), particularly Corporal Chuck Sitarski (Treat Williams) and gets fired from his job. Toshiro Mifune is the captain of the sub, whose mission is to attack Hollywood and thereby demoralize America. On board with his crew is Christopher Lee as a German Nazi intelligence officer serving as observer. Unfortunately, they don’t know where Hollywood is. Loomis Birkhead puts the moves on Donna Stratton. Tim Matheson and Nancy Allen in ‘1941’. Meanwhile, in Long Beach, Captain Loomis Birkhead (Tim Matheson, “Otter” from Animal House) has recognized General Stilwell’s (Robert Stack) secretary, Donna (Nancy Allen, Robocop) and remembered that she gets aroused by airplanes, so he schemes to get her onto a plane and seduce her. Also meanwhile, Captain “Wild Bill” Kelso (John Belushi) thinks he’s chasing a squadron of Japanese Zeroes across the California desert. Ned Beatty is a family man whose home overlooks the ocean in Santa Monica; his daughter Betty (Dianne Kay, Eight is Enough) is Wally’s girlfriend and a hostess at the local USO club. The army unit from the restaurant has parked an anti-aircraft gun on Beatty’s front lawn (this really happened). Sitarski meets Betty and flirts with her. Betty’s friend Maxine (Wendie Jo Sperber) is smitten with Sitarski, who is not at all interested. Hollis “Holly” Wood fought your kind in the Great War. 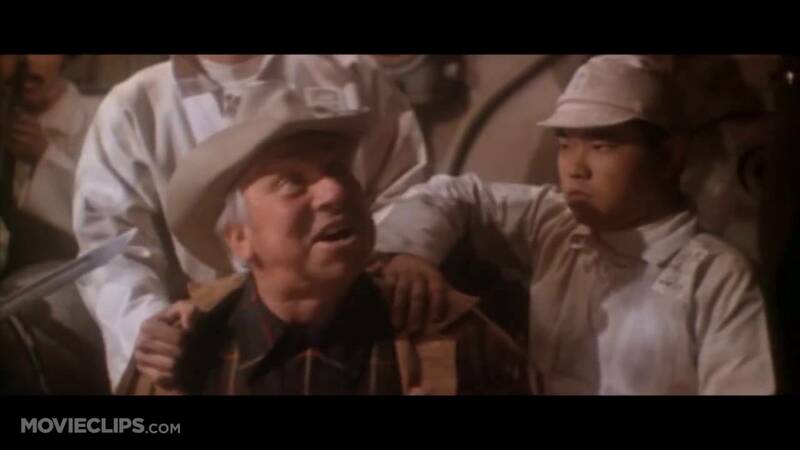 Slim Pickens tells off his captors in ‘1941’. Meanwhile, the submarine crew has sent a landing party to find Hollywood. Instead, they abduct a Christmas tree farmer named Hollis “Holly” Wood (Slim Pickens, Dr. Strangelove), and intend to force him to reveal the location of Hollywood. Also meanwhile, Loomis and Donna have made their way to Barstow to borrow a plane from a training base run by lunatic Colonel “Mad Man” Maddox (Warren Oates) so that they can get their airborne freak on. When 1941 came out, it was widely reviled as being racist, due to the pervasive slurs against the Japanese peppered throughout the script. Modern audiences overlooked the fact that the film is set about a week after the Pearl Harbor attack. Anti-Japanese sentiment was roaring, and a lot of it involved offensive stereotypes, derogatory cartoons, and vulgar imitation of a pseudo-Japanese accent. For example, Spike Jones and His City Slickers had a big hit with their song, “You’re a Sap, Mister Jap.” If anything, 1941 vastly underplays the extreme racism of the time out of consideration for modern sensibilities; in reality, those insulting terms were commonly used by public officials and in newspapers, movies, radio, comic strips, and comic books, to a far greater degree than anything heard in this movie. Asian stereotypes were so common and so deeply entrenched in the culture that they were still prevalent in entertainment right up into the 1960s (see Mickey Rooney in Breakfast at Tiffany’s). If you’re going to make a movie set in Southern California that takes place in mid-December 1941, anti-Japanese attitudes are a huge part of the story, and ethnic slurs are going to be a commonplace part of the dialogue, unless you’re doing a whitewash. Given that part of the story also involves the notorious “Zoot Suit Riots.” and that the US military (and most of the country) was still segregated at the time, there are a lot of areas in which racial tensions show up in the script, usually as reflections of the society of the time. 1941 is not a racist film, it is an accurate portrayal of the racist attitudes of the time in which it’s set. Stanley Kubrick told Spielberg that 1941 was “great, but not funny.” I mostly agree with Mr. Kubrick, although many parts of it are funny, particularly the lunatic fringe. Belushi’s “Wild Bill” Kelso is barking mad and wildly irresponsible, leaving a path of destruction in his wake. Sometimes deliberately, as when he shoots the gas station radio, but more often unintentionally. Kelso is basically Bluto Blutarsky gone to war, and he steals every scene he’s in. Matheson’s desperate attempts to find a way to indulge Allen’s aerophilia fall more into the realm of “cringe comedy,” which wasn’t really in vogue in 1979. Neither were the awkward attempts at race-based comedy in which John Candy’s racist jerk Private Foley was pitted against African-American Private Ogden Johnson Jones (Frank McRae). The film also suffers a bit from the ’70s trend of comedies descending into carnage, as exemplified by many of John Landis’ films, including The Blues Brothers, Animal House, and American Werewolf in London. The last 20 minutes of the movie is an ever-escalating symphony of destruction that includes driving a tank through a number of buildings, crashing a plane on Hollywood Blvd., sending a fully-lit ferris wheel rolling into the ocean, and completely destroying a house. Some of these moments are funny, usually due to the quiet determination of Ned Beatty, but others are just needlessly frenetic. Treat Williams’ performance is borderline psychotic, far in excess of the demands of the plot. Some of the toilet humor involving Hollis Wood is on the gratuitous side, but his character is funny. Okay, so there’s a list of things that are arguably wrong with the film. What’s good about it? Why am I defending it? Some things I like about the film are the many little bits thrown in for people who are paying attention, like the fact that the Japanese submarine commander and the German intelligence officer understand each other even though they are speaking different languages; since we’re reading the subtitles, we don’t immediately notice that nobody’s translating for them. I find that funny. I like that Spielberg actually went to the trouble of hiring the same girl who was attacked by the shark in the opening of Jaws to parody the scene in the opening scene of this one. Bobby Di Cicco holds up his end of the comedy, aptly leaping from being a hapless Gilligan in over his head to being the smartest guy in the room, sometimes in the same scene. His spectacular performance in the combination dance contest/bar brawl (set to “Swing, Swing, Swing”) is brilliant, and Joe Flaherty’s sardonic take as radio host Raoul Lipschitz makes that scene even funnier. Di Cicco’s dance partner, Dianne Kay, more than carries her portion of the movie. She is perhaps the only sane person in the film, and her reactions to the lunatic asylum in which she finds herself are perfect. Whether fending off Sitarski’s creepy advances or trying to process her father’s actions, Kay grounds her scenes in reality. She’s a good actress and should have had a much more successful career. If 1941 had been a hit, she would have been a major star. Another favorite sequence is Murray Hamilton’s slow burn of exasperation with Eddie Deezen. The two are civil defense volunteers assigned as lookouts, and their assigned lookout point is at the top of the aforementioned ferris wheel. 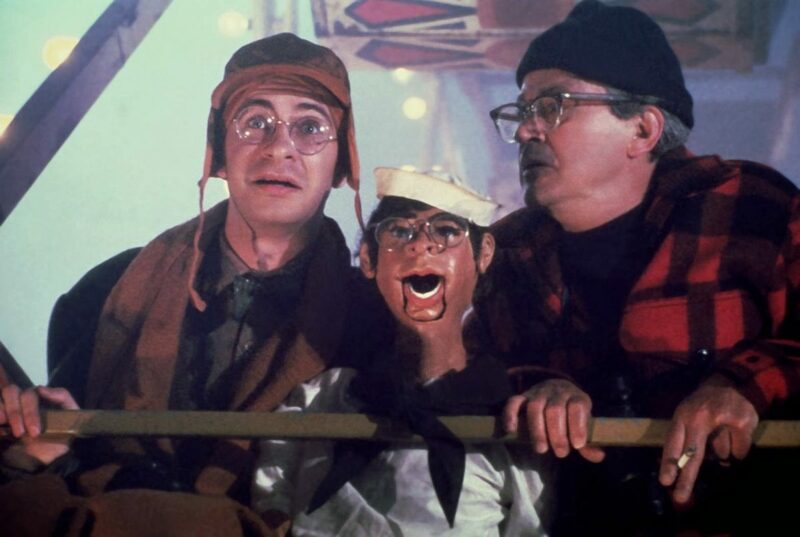 Hamilton is terrified of heights, and he’s locked in a seat all night next to Deezen, the world’s most annoying nerd (you saw him in Grease, and most annoyingly in WarGames), and he’s brought along his ventriloquist dummy. Hamilton’s fatalistic “I’m in hell” performance is hilarious. Trapped at the top of a Ferris wheel with the most annoying man in the world when you’re afraid of heights? Claude is in hell. Eddie Deezen and Murray Hamilton in ‘1941’. I like that TV’s Lenny and Squiggy (Michael McKean and David L. Lander) show up in a cameo as Bill Mauldin’s Willie and Joe, even if nobody else in the audience knew who they were supposed to be. I like Robert Zemeckis’ intricate plotting, weaving the disparate stories and characters together and having their paths cross in various ways, ultimately bringing them all together in the chaotic climax. The final scene with Ned Beatty’s inspirational speech and what follows, is perfect. But truthfully, the single best thing about 1941 is the music score. The 1941 Theme is hands down the best march John Williams ever wrote. All in all, I think 1941 may have simply been ahead of its time and a victim of bad marketing. Kubrick felt it should have been sold as a drama, but I think it’s more of a sardonic satire. As a comedic indictment of ignorance, irresponsible self-interest, and blind panic, it effectively makes its points, and it may have been better received if it had come out 10 years later. I think the film holds up well, and is well worth a second look. Or a first, if you’ve never seen it. Behold the magnificent glory of ‘Reefer Madness’!!!! Hmmmm, I’d say his other flop is The BFG. That had to have lost lots of money. So at least 3. I think the “racist” stuff stands out because it’s supposed to be a comedy. It’s not Schindler’s List, it’s not a documentary. So it’s hard to say it’s farcical at one moment and it’s an accurate depiction of the times in the same breath. You can get away with it if you’re Blazing Saddles, because you’re A. Funny and B. mostly poking fun at those who are the racists. I’m sure a lot of it is people looking at it with modern glasses on. There’s usually 3 categories: things that were just a part of their time, and you can’t change history; things that didn’t seem so bad back then but don’t really fly now; and things that were racist then and racist now. I don’t know where this one falls into that. I know Asian racism has seemingly been “ok” a lot longer than it was to make fun of other minorities. I loved Murder by Death, and understand Peter Sellers made his career off of playing oddball characters, inspiring Mike Meyers whole character and costume choices. But watching it now is a little cringe worthy. And you can go well into the 80’s with movies like Sixteen Candles and Long Duk Dong who are just this side of minstrel shows. With the opening of of the Asian film markets it’s changed some, but there are still a lot of Ghost in the Shell choices going on in Hollywood. I just think it’s unfortunate, that will all the movies Spielberg has done with Tom Hanks, that he never got to use Wendie Jo Sperber in a scene with him. Several people on the Classic Comics Forum have commented recently that the comic adaptation of this movie works better than the movie does. The adaptation was published in 1979 by Heavy Metal, with script by Allan Asherman and art by Stephen Bissette and Rick Veitch. If I noticed (and I probably would / did), I’d just think that they’re two people who can understand each other’s languages but are speaking their own. I’d take it for granted and neither think it was funny nor a problem. My boss in the Navy was the son of an American father and Dutch mother and spoke fluent Dutch. We had a port visit from a Dutch naval vessel and he went down to meet the officers. When he came onto their quarterdeck, he spoke to the watch in Dutch and they were speaking to him in English and it took a few minutes for both to realize they were understanding each other while speaking the other’s language. Count me as another who likes this movie; yes, it’s got it’s flaws, and it’s certainly not a conventional comedy, but it’s definitely worth watching. By the way, I first saw this on VHS in college with a few house-mates. We all loved the movie, but one thing that made us cheer out loud was when we saw that one of those hyperactive little kids running around the family home in Santa Monica was played by a certain Steve Mond – who lived on the same floor of our dorm in college the year before. He later occasionally appeared in Diff’rent Strokes, playing one of Arnold’s school chums, which he often mentioned, but never talked about this role. Our admiration for him really increased, although I honestly think he was mystified that we liked the movie at all. I remember a bizarre shtick in the TV series version of Mr. Roberts where the Japanese sub crew shadowing the ship are talking English but getting subtitles in Japanese. Which they can see. Actually I think the racism isn’t exactly true to the times. In one of the early scenes, a general brushes off all the crazy talk about Japanese spies and subversives as the nonsense we know it was; in 1941, people took it with complete seriousness. But my main objection to the movie is it’s just a big, suety lump of crap, despite the talented cast (sorry not to be more precise in my review). I’ve never gotten much further than about 15 minutes of this film. It was so painfully unfunny I couldn’t continue and that was even after Belushi showed up. I can speak about Always, as I had the misfortune to see it in the theater. It’s just plain boring. The characters aren’t particularly engaging, the romance never comes across very well and it is so forced in its sentiment that you never buy into it. John Goodman is about the only one I thought succeeded in making his character more than what was on the page, though Audrey Hepburn has a nice turn. Then again, that is mostly by just being Audrey Hepburn and having been away from Hollywood for so long. The actor who plays the hunk, Brad Johnson, was an ex-model and not much of an actor. He might as well have still been on a billboard, fro as stiff as he was. Holly Hunter and Richard Dreyfuss had no chemistry, so you never quite buy that she is mourning for him. He was deep in a period of mediocre work (with things like Moon over Pardor) and this did nothing to change it. The film is a remake of A Guy Named Joe, which had Spencer Tracy. Dreyfuss is a fine actor; but, he’s not a Spencer Tracy and romantic drama is not Spielberg’s forte, any more than comedy was. There is one interesting bit of trivia about 1941: it is filled with stunts from most of the Epper family, a legendary family of stunt performers in Hollywood. As Spielberg said in a documentary about Jeannie Epper (stunt double for Lynda Carter, on Wonder Woman) there were Eppers flying around everywhere on that set. Yeah, I had the misfortune of seeing Always, albeit rented and not in a theater. So boring, and so syrupy. I didn’t even know it was a Spielberg film. I lump it together with another rather similar, film made only a year or two later, Once Around – also starring Dreyfuss and Hunter. Normally, I like both of them, Hunter especially, but it seems like when they’re cast together they produce the opposite of movie magic. I’ve seen both movies, once each, not long after they came out. And that’s about all I can say about either of them. I once had a conversation with a school friend from France, him speaking English, me speaking French. Similarly, I’ve noticed most people seem to know a lot about two countries: their own and the USA. When your own country is… you get the picture.